I bent this funny little puppy as a commission for my very good friend Ernst Markus Stein. In his kitchen. With a bare minimum of tools and the most crooked soldering iron I've ever had the displeasure of holding in my hands. Once we were home, I got straight to work, as usually replacing the samplers inbuilt crystal with a ltc1799 clock circuit, thus making the sample rate and recording time variable. Also, I modified the speed dial for the tape motor to cover a wider range, so now both tape player and sampler can be pitched continuosly from ridiculously fast to very, very ssssssslllllllllloooooooooooowwwwwwww. By wiggling both around for a bit before hitting [Wiederholung Lehrer], you can create samples that warble all over the place like crazy. I also built in a bending matrix of 10 switches that add different loop points, tonal changes and overall digital mess to the samples. Since I don't own the Linguaphone, I can't make any pictures or videos of it at the moment, but Ernst Markus is using it very frequently when he's out and about in Berlin. 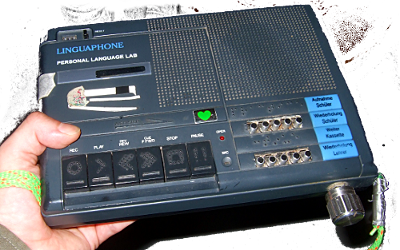 So if you happen to be around there, and you see a guy doing pretty amazing/annoying stuff with a strange tape player, chances are it's him and the linguaphone. Ever since I built it, I wish I had one of myself. Then again, I already have so much stuff lying around, so it's probably for the better it lives with someone else. Still, if I randomly saw one somewhere, I'm pretty sure I wouldn't be able to resist..
Hey, we picked up Marcus and his friend on their way out of London a couple of years ago. They were travelling back to Berlin and they hitch hiked in our van (we were travelling to Paris) Marcus showed off this gadget and we were really impressed! I have a video of it in action if you would be interested to see? that sounds like a fun random encounter. Seems even more random that you came across my website. Just out of interest: how did you find it? And yeah, of course, I'd be very interested in seeing it. If you'd be alright with it, I'd even consider putting it on this site. Of course with credits and stuff. can you please email me a hi-res version of it?